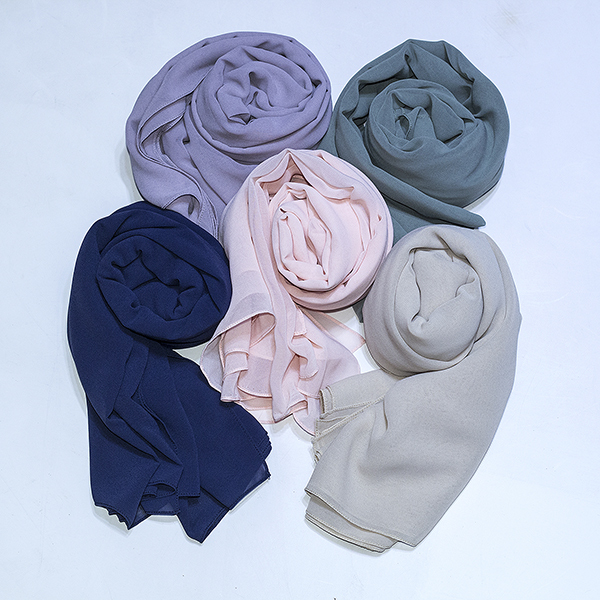 Finally the first part of "On Your March Series" has been arrived, and based on our customer request, we launch the 'Wide Square Hijab" first. 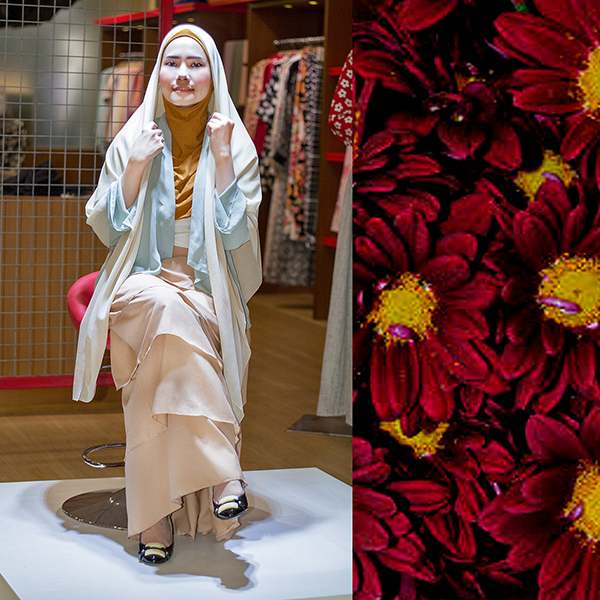 The 1.5 meter x 1.5 meter Wide Square Veil, even though is basic, is quite ideal for any kind of hijab style and inline with syari' principle as well. You can create hundreds of style from this wide veils. 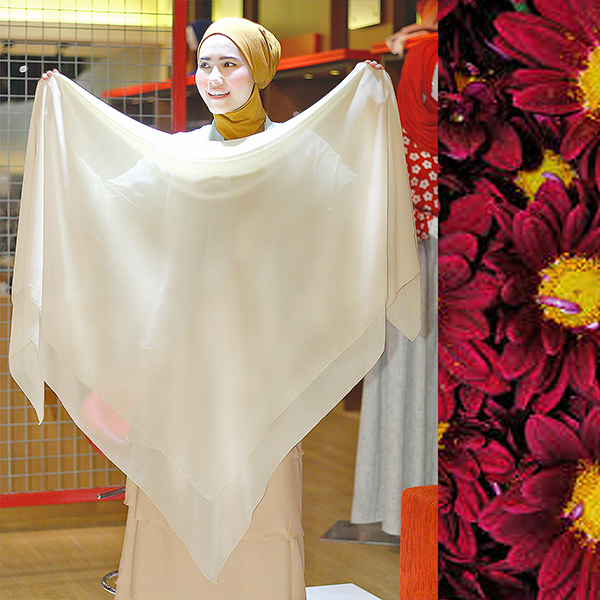 We provide you with simple but powerful Wide Square Veil Tutorial for your daily activities. Color options: Peach, Navy, Creme, Dusty Green, and Purple. Jalan Terusan Ir. Sutami Kav. B13, Setrasari, Bandung. Fold the Wide Square Veil to create a triangle shape. 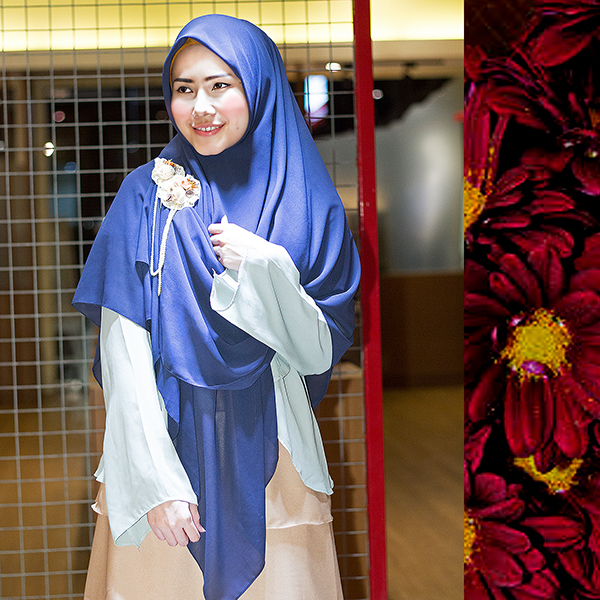 This is to make you easier to create any hijab style. Put the folded veil on your head, and make sure left and right sides have balance/equal measure. Prepare a small pin, and put it to the right side of the veil. Please be careful, mind your head, don't puncture you head with that sharp object, just make sure that the pin attached firmly to the veil. Hold the right side of the scarf, about 3/4 of the veil from the tip of the veil, and prepare another pin. The direction is: the scarf will be pinned to the left side of the veil, closer to the back of your head. Put the pin on the side of the veil, you can use some jewelry or other pin accessories to make it awesome. Make sure that you don't pin the corner of the scarf but about 3/4 from the right side of the scarf. The final effect will be absolutely different if you pin the corner/tip of the scarf. Now hold the left side of the scarf, and hold about 3/4 of the scarf. We are gonna put that side to the right side of you shoulder, prepare another jewelry or pin accessories in front of you so you can each it quickly. And then pin the scarf to right side of your shoulder, please be careful, make sure you don't hurt yourself with the sharp needle. And put it carefully as well to maintain your scarf in good shape. Another broochs/accessories can also be used to make your "Hijab Style" better. Mimi Alysa put some hand-made brooch as a simple but cute accessories. And now you're ready to go.